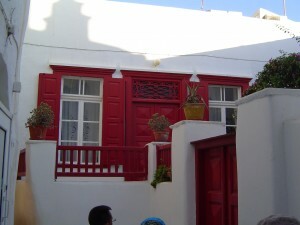 Mykonos is possibly the best known of the Greek isles, due to Jackie Onassis hanging around there. I’ll never forget the huge controversy when she got off her yacht wearing pink and orange together. Now this is a thing, as in p’orange. 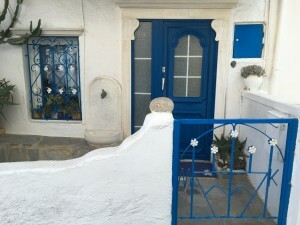 Mykonos is also the most touristy of the islands, probably for the same reason. 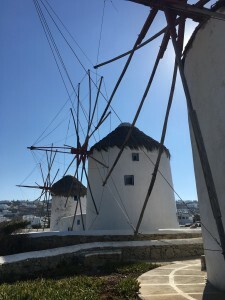 Here, you can stay in old windmills, rehabbed to be quite costly. 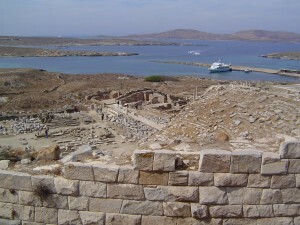 Mykonos is also the nearest island to Delos, the most sacred of the Greek isles. No one lives there, but the ruins are world famous. The pathways are likewise ruinous, we discovered. We arrived via ferry from Santorini. Our tour company had reserved airplane-style seats for us, so we relaxed for the 1 ½ hour scoot across the water, water-planing smoothly. 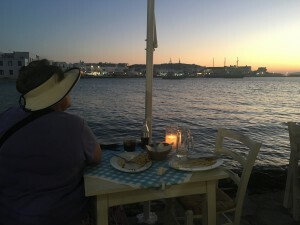 I was aghast to discover that the romantic island of Naxos, where Dionysus fell madly in love with Ariadne [you remember, after Perseus had abandoned her], is actually pronounced “Nachos.” Alas. This time, our guide kept us much too long describing all of the best party beaches and how you can’t really get there. But the hotel provided a refreshing glass of cherry juice and we finally got to go to our room. 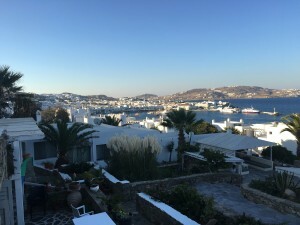 The hotel is built on a series of terraces, which gently make their way down to the swimming pool and eventually to the harbor. 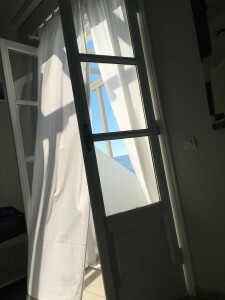 The breeze off the Aegean blows day and night, so we slept with the French doors open at night and the long white curtains billowed in from the tiny balcony. 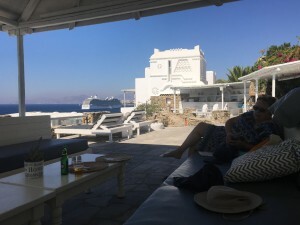 After a rest, we walked down to the “corniche”.4 On Mykonos, it skirts a beach full of feral cats and men fishing for octopus; on this scene, we found the Kavos restaurant poised directly on the water for souvlaki and gyros. Thousands walked past us, presumably from a cruise ship, but we ignored them and watched the sun set over the little bay. 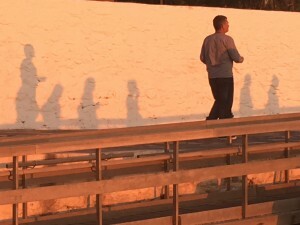 Just before it was gone, the sun cast blue shadows on the white seawall. When we were finished eating, the waiter cleared our plates by throwing the leftovers into the sea, where scads of tiny fish were waiting. The next morning, we wandered into Old Town taking loads of photos and window shopping. Very high-end shops, scenic, but a little precious for my taste. Worn out, we walked up the hill to the hotel pool; we had been told that the hotel bar was open when the restaurant was not. We thought perhaps a cold drink and some snack food, but the bar turned out to be a fantastic source for freshly made fruit plate and pita with tzatziki [yoghurt with herbs and cucumbers]. As the waiter brought over our food and drinks to the awning’d / bench’d nook we’d claimed, he introduced himself. After an interlude by the pool [too lazy to swim] we took a nap. Greek islands lend themselves to such indulgence. 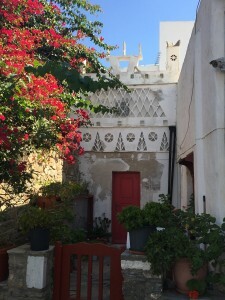 We had planned on a museum visit, but the size [small] and cost [large] dissuaded us and we wandered back to town, finally returning to “our place” on the corniche for a supper to fresh tomatoes and a Greco pizza. This time, I threw the leftover pizza bones [crust] to the fishes and tiny crabs. 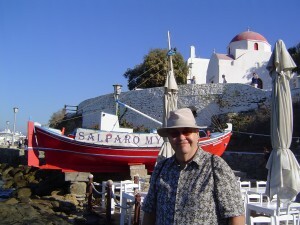 Sunday Oct. 1 saw us up early to catch the ferry the short distance to Delos. We realized suddenly that this was, ironically, our second Sunday visiting a major shrine to Apollo. But then, SUNday is named for him. We grabbed some extremely delicious buns and “filter” coffee at a patisserie near the hotel. We needn’t have rushed, as we had to wait at the ferry a very long time for a tour group to arrive [from a nearby luxury sail-ship cruise]. 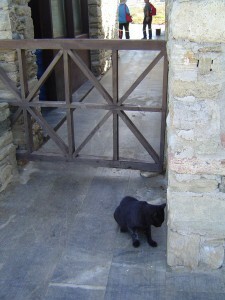 Arriving at Delos, we were greeted at the ticket booth by an official cat. The tour group went haring off with a purpose, so we went the other way and had the site almost to ourselves. The lower section of the island is well-paved and well signed plus we had a map and a purchased guidebook [bought in town the day before]. We enjoyed fresh squeezed OJ at a tiny café—with cats—and toured the museum. 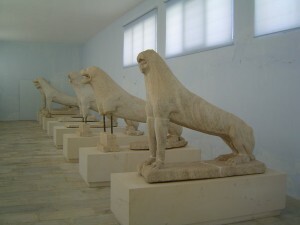 Most of the finds on the island are housed in the museum for preservation, with replicas in situ. This is the pattern for ancient sites, and we take great pains to find out where the originals are before we plan our trip. [EG, the original art from Pompeii is in the city of Naples. Very very few people realize this, though the replicas are quite good, you’re missing the real deal]. Outside, we began climbing Mt. Cynthus, seeing the temple to Isis in her Greek form. Delos is a strange mix of great care and carelessness. Many of the houses were reconstructed but gated, so it was too dark to see the floor mosaics within. Others were open to the elements, buckling where water stood. This housing district, late Greek, early Roman, was evocative of its times, like Pompeii, but without the tragedy. We gazed, fascinated, at huge half-burned storage pots; doorways of marble where the locations of doors and locks could be seen etched into the soft stone; niches in the walls where the family gods [lares] would have been placed. We paused to rest in the large amphitheater, then began our descent, unable to reach the top of Mt. Cynthus. OH! The trek downhill was most treacherous. The pathway had been washed out at some point and never repaired. Thus worn down to stubs, we boarded the boat for Mykonos, taking many photos of the mountain, where we dared to tread. As we ferried, we could look down into the water to see clearly down 40-50 feet. Then, as the sea floor fell away, the water became “wine-dark” as Homer describes it. It is not purple like wine, but a dark translucent quality of which “wine-dark” is descriptive. And , upon this thought, 3000 years fell away. Early next morning, we boarded out short flight to Athens. 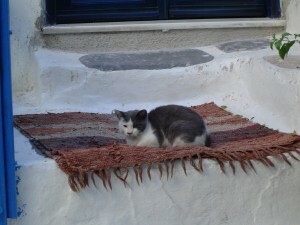 There were cats in the waiting room at the Mykonos airport, feral, but lap-sitters nonetheless, shifting from lap to lap as people got up for their flights. I think airport therapy cats should be a thing! Miserable wait in Athens as the BA counter wasn’t open yet, but after we finally got through security, we found a huge McDonalds with power plug-in s at the tables and plenty of room to park luggage. Kudos to Ronald!! 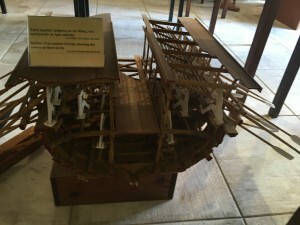 We took turns visiting the airport museum, wherein were showcased the finds from the building of the airport…a mere 15 year ago. Scratch the earth in Greece and you’ll find a treasure. Four hours to London; seven hours to Dulles [DC] and home.